Survival of the species comes down to three basic instincts, say behavioural research strategists Dan Gregory and Kieran Flanagan—fear, self-interest and simplicity. These basic human behaviours come into play in all types of relationships, including those between businesses and customers. 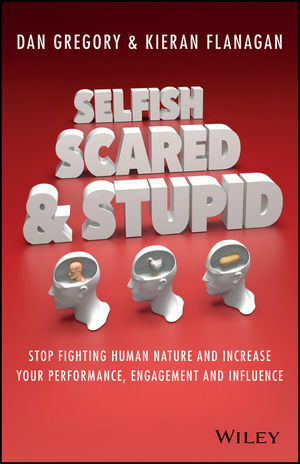 Selfish, Scared and Stupid: Stop fighting human nature and increase your performance, engagement and influence, demystifies these behaviours and examines the psychology behind why even the best ideas sometimes fail. This book helps businesses design their organisations for reality rather than perfection, and also offers strategies to head off unprecedented levels of disengagement within, and outside, the business. It answers baffling questions around why the public sometimes fails to engage despite overwhelming data suggesting otherwise, why so many new products end up on clearance shelves and why so many great salespeople often fall short of their monthly targets. This provocative book is built on the idea that businesses must return to a more human engagement methodology in order to succeed. It is an informative read for anyone interested in improving influence, growing business reach, improving sales figures or understanding the complexities of human behaviour.